Meet the truck that hefts any load — be it bricks or broccoli — with a new kind of economy you’ll appreciate a dozen times a day. This is the 1960 Dodge Sweptline. Go 0n — pilot it down a busy market alley and see how it scampers through traffic . . . Here we see a good example of the “new illustration” that was beginning to take hold at the start of the 1960s before it was stomped out for good by color photography a few years later. 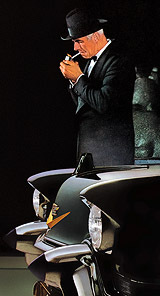 This one is unsigned but bears a similarity to the work of Bob Peak as well as the secondary art in the 1959 Edsel brochure, which is on our to-do list. While Dan Goodsell is away at the New York Comic-Con, we’re looking after Mr. Toast. The little fellow doesn’t say much but is pretty interesting once you get to know him. In case you haven’t met, Mr. Toast is a very keen observer of life’s pageant, and possessed of an almost Zen-like calm. Upon his eerily blank countenance, you can project just about any emotion you want and have it returned with the vacant gaze and affectless demeanor of a therapist who’s heard it all. Plus, he’s edible. ≈ It’s a Hiawatha Year! The Milwaukee Road ran from Chicago to Seattle, with spurs to Omaha, Sioux Falls and Yellowstone National Park. From 1948, an illustration of the Hiawatha streamliner’s observation car. His love of sports cars . . . Her love of beauty and comfort . . . are “married” in the years-ahead 1957 Plymouth — three full years ahead of the “other two” with revolutionary new Torsion-Aire Ride . . . terrific new FURY V-800 engine . . . new sports car handling . . . Flight-Sweep Styling. See it today at your Plymouth dealer’s! From 1947, another cheery message from the American Meat Institute. Mr. Perkins isn’t only missing his train. He’s missing the fun of driving with Ethyl . . . Rain storms will play tricks on you. And so will an old motor — unless it has Ethyl. But stop beside the pump that bears the Ethyl emblem every time you need gas and then you know what your car will do. It will run its best all the time! You don’t always want top speed — or flashing pick-up — or the extra power it takes to zoom over hills in high. But when you do, you want ’em! Ethyl, now sold by oil companies at only 2 cents per gallon over “regular,” brings back the fun you used to get from your car . . . Missing your train and having to ride home in wet fur were just two entries in the long catalogue of woes sure to befall motorists who failed to stop at the Ethyl pump. 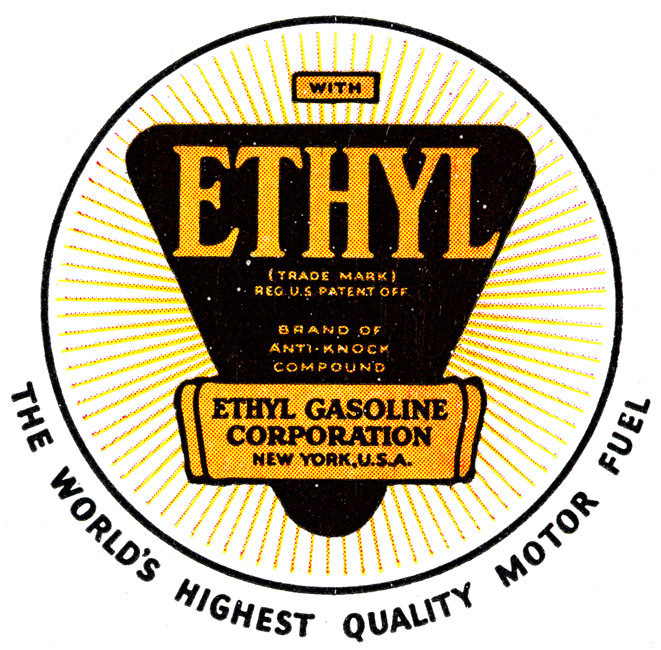 From 1933, a pair of illustrations by Frederic Stanley for the Ethyl Corporation, whose various advertising campaigns ran for decades and whose tetraethyl lead additive put the lead in high-octane gasoline until the mid-1970s. on the food you eat. Eat right to work right and live right. We really couldn’t have put it better ourselves, although our hoe-swinging days are long past. Illustration from 1944 by John Clymer. They didn’t pass you when your car was bright and new — and you still don’t like to be left behind. These days, when we have to do without so many things, we can at least make the most of our cars. If you must make your old car do, give it Ethyl and feel lost youth and power come back as harmful knock and sluggishness disappear . . .
his dad and a Depression-era case of road rage. ≈ Ford Out-Values Them All! The silent, solid comfort of the ’57 Ford starts with a brand-new, wide-base frame that lowers the center of gravity. There’s new suspension front and rear. And new Thunderbird V-8’s deliver the smoothest power you’ve ever bossed . . . This Ford ad from 1957 has a two-tone Fairlane 500 Town Victoria and a geography puzzle. The clues: A highway sign with an M over the number 17 (mile marker? route?) and another one pointing the way to Silver City and O’Fallon. UPDATE: The sign is a Michigan route marker; there’s also a Silver City in Michigan. The hills in the distance would be the Porcupine Mountains. O’Fallon might be just a dot on the map, or even the name of the artist. Here we have the Family From Hell. They’re headed back home. They’re hungry, too. Hungry as you-know-what. But wait, is that a hitchhiker up ahead? Yes! Let’s stop and pick him up. Because he looks delicious. Did anyone bring the ketchup? All right, so this ad, from 1954, doesn’t really say that. It says blah blah blah “high-octane gasoline.” Which is an anagram of “He egg, oh Satan Oil Inc.” Coincidence? We think not. New Meat Development for American Fighters — Grilled Hamburgers in a Can — Cooked, browned, then sealed in vacuum to hold that right-out-of-the-skillet taste. From the waning days of World War II, we present what might be the least appealing food ad ever published. The American Meat Institute, which seems to have done its darnedest to come up with one ghastly visual after another, is responsible for this 1945 illustration of . . . two cinders and a smokestack? But rub your eyes, narrow your gaze and what you’re actually witnessing is the deployment of the canned hamburger, an innovation that was superseded a few months later by the atomic bomb. They wouldn’t think of going anywhere without me! I’m up in the milky mist of morning and off to cool, clear fishing streams. I roam through forests alive with green — and streak over the highways to busy cities and the budding countryside. I am a playmate — business partner — and household servant. I am the 1941 Lincoln-Zephyr (and you ought to read my fan mail!). Take a ride in this fascinating new car and you’ll understand why folks love it . . . why it has captured the imagination of the entire country! Letters from every state in the Union describe the thrill of driving this fleet, low-slung beauty, triple-cushioned in rubber, smooth as a glider’s flight . . .
A Valentine from 1941, by way of 2006. And a big heart-shaped box of chocolates. The dark kind that’s supposed to be good for you. This year you need a REAL vacation. You need to breathe fresh air, see new places, and wash away your worries with comfortable, refreshing travel. Even an old car can give you that kind of vacation if you just do one thing: give it Ethyl. Ethyl Gasoline banishes harmful knock, overheating and sluggish performance. It puts new life into your car; brings back the youthful power that makes it fun to drive! Whether you’re making week-end trips or crossing the continent, remember: the next best thing to a brand new car is your present car with Ethyl. Going to the World’s Fair? Be sure to visit the Ethyl Exhibit at the Century of Progress while in Chicago. From 1933, an illustration by Frederic Stanley of two nattily attired lads making their way to the World’s Fair in Chicago. We long for the days when highway signs were painted on boards nailed to a post. In 1952 Hunt Foods began a series of trompe-l’oeil catsup ads that would be impossible with today’s shrunken mags. You turned the page, and there was a life-size picture of a Hunt’s bottle spilling its guts on a plate of food. Almost 50 years after this 1957 ad, it’s still a delicious idea. Mmm, steak . . .
A buffet of our greatest hits, as much as you can eat, open bar. We recycle. ≈ Can Men Be as Smart as Women? This is a touchy subject, so let’s confine it solely to clothes. For example, outdoors on warmish days, or indoors in warmish rooms, most women dress lightly and rightly, while many men wilt woefully in heavy-weight suits. But thousands of men, now as smart as women, enjoy the comfort of new, lighter, medium-weight suits . . . called Tempawate by Hart Schaffner & Marx . . .
With the addition of this illustration by Tom Hall from 1956, we hereby restore the word “Tempawate” to its rightful place in human affairs and Western civilization, where until today it had zero hits. Yes, we suggest you let your eyes — your driving and riding experience — and your judgment of automotive values inspire you to make the happy decision to choose this thrilling new Chevrolet for ’49. Its outstanding Fisher body lines, its champion Valve in Head performance, will tell you, unmistakably, here’s the most beautiful buy of all! Put it in the pan . . . turn on the heat and sniff its steaming fragrance as it simmers, bubbles and browns . . . smothered in its own gravy . . .
You might have read about the $415 million medical study that just came out on low-fat diets. The findings: They have zero effect on your chances of getting heart disease. If only the researchers had seen this first. From 1947, one in a series of grisly (and gristly) messages from the American Meat Institute. And no, we are not making these up. ≈ It’s Blended . . . It’s Splendid! Whatever happened to Pabst? Whatever happened to bowling? What day is it? Every ride in this gleaming masterpiece is a sparkling special occasion! no match for this regal Catalina — at any price! this Star Chief for 1956 was the division’s first four-door hardtop. Should a kitchen be just a place to cook? Here’s one that’s also the center of family life. It’s a place where your toddlers can play and the other children can come to tell you all about their adventures at school. Here you and Dad can relax of an evening and discuss the ups and down of the day. It’s a step-saving room, too — and, above all, it’s practical, with its plastic floor of Armstrong Excelon Tile . . . 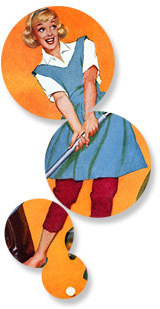 In 1954 Armstrong Cork started a long-running series of ads notable for their use of color photos rather than the painted illustrations common at the time. Each was a tableau that, despite being devoid of people, told the story of a family and its interests. Zoom in and you’re in the kitchen of a household with small children, including a baby who uses a high chair. Mother’s chatting on the phone and getting dinner ready when she’s called away by a knock at the door, or maybe a skinned knee in the carport. Are you coming back, Mama? First impressions count at any time of the year . . . never more so than in summer. Hot weather may be an alibi, but no longer an excuse for sloppy appearance. Now, smart grooming is easy, lasting and economical with the right fabric in your summer suit. Through a most careful blending, Pacific has developed Mohara, a new, pleasantly cool tropical plus. Mohara combines all the natural advantages of mohair, the most resilient and lustrous of all animal fibres . . . In the days when relatively few offices had air conditioning, summertime and business suits made for a hot if not hostile work environment. Mohara, a lightweight wool made from goat hair, was one answer. This double-breasted example from Pacific Mills cost $32 in 1946. We see an office romance in the making. Possibly two. You’ve dreamed . . . forever . . . of this minute. You’ve lived . . . forever . . . for this minute. You start forever with this minute. This is for keeps! For keeps, too, you know beyond all knowing, you want Community. You’ve dreamed of arranging your table for two — his place, your place — with all the Community you need. Dreamed of entertaining — proudly — knowing your guests will whisper: “Isn’t she lucky — it's Community!” Community is silverware that looks to the future . . .
From 1946, one of Jon Whitcomb’s many illustrations in a long-running series for Oneida’s “Community” line of silverplate. Firemen know that you can get where you’re going sooner and safer in a car that’s quick, agile, easy-handling — and a tiger for acceleration. That’s the ’56 Chevrolet all over! When you put your foot down for passing, this beauty means business! Horsepower that ranges up to 225 explodes into action to zoom you out ahead with extra seconds for safety. Yet this tigerish power is as tame to your touch as a purring kitten (and almost as quiet, thanks to hydraulic-hushed valve lifters now in all “Blue-Flame” and “Turbo-Fire” engines). It’s a honey to handle in traffic . . .
A wonderful illustration of the 1956 Chevrolet, a car we always thought was nicer looking than the more popular ’57. 1950s advertising definitely did not lack for smiling faces. In retrospect some of these people look so blissed out, it’s downright unnerving, especially considering the fact that they’re not doing much more than the dishes. Behold our latest gallery. Whee! Meteor presents 24 models in five great series and priced as low as its silhouette. Meet the newest of the new in the magnificent Meteor for 1957. It’s the exciting Rideau 500. Here is bold evidence of daring design that will keep you miles ahead. They’re longer, lower and wider. But not just for appearance . . . The late-1950s parallel universe of slightly de-contented Canadian cars saw Pontiacs with Chevrolet underpinnings and Dodges with Plymouth rear ends (the so-called “Plodge”). Ford’s equivalent of its namesake brand was the Meteor, with the Rideau 500 standing in for the Fairlane. A rung up in the corporate hierarchy was the Monarch, close cousin to Mercury.